8 Best Ways to Heat an Outdoor Space & Keep Warm This Winter Season! Old man winter is putting a chill in the air. That doesn’t mean you can’t still enjoy spending time in your outdoor spaces. There are several ideas for heating outdoor spaces both functional and decorative that will keep your patio, backyards, & the outdoors warm for entertaining and family living this Winter season! One of the “hottest” trends for outdoor living is the fire pit. Not much adds to the fun during chilly months like these sources of sparkly warmth. Fire pits are versatile and practical for heating outdoor spaces. Your family will make memories hanging out at the pit – toasting marshmallows or sipping hot chocolate. Guests will love huddling around the fire with a glass of wine. Outdoor fireplaces are a wonderful architectural feature. They will be the focal point of your landscape design. Fireplaces give off a friendly warmth and bring coziness to you space. Can you imagine yourself toasting chestnuts over the open fire? Singing old camp songs? 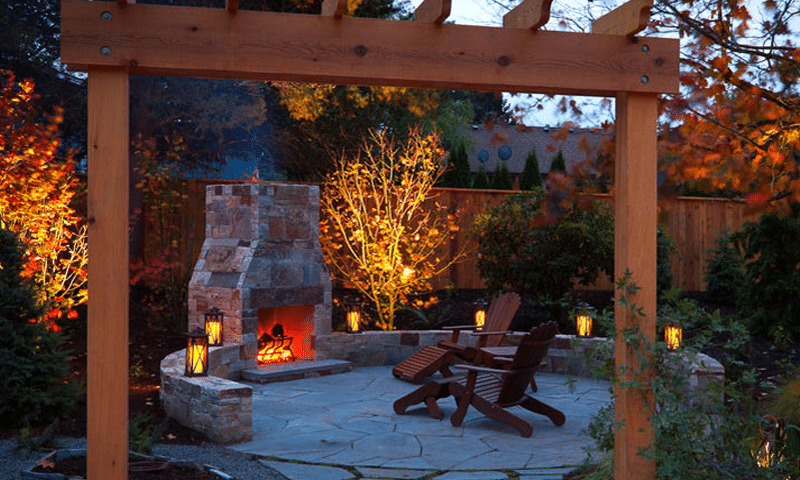 For family fun and cherished moments, an outdoor fireplace would be a great idea for heating outdoor spaces. A unique choice for a warm gathering spot is a gas fire table. These products typically resemble the size and look of a coffee table or small bar top. The flames come up from a gas unit in the middle of the design. Many creative tables are on the market today, but we like Belgard products. They are constructed to be durable and attractive. Another great idea for heating outdoor spaces are heaters! Portable heaters are not the industrial looking items of past years. Now they come in many sizes and tasteful styles. Most can be found at big box stores or through online shops. These smaller heaters will usually warm an area of about five feet. The propane tanks that fuel them are available from numerous hardware or sporting supply stores. These larger heaters also come in a variety of styles. They will have a greater heat output and benefit from propane tanks that can be refilled. Some models can be tall so be careful when using them in covered spaces, like a porch. If they are too close to the ceiling they might leave a heat mark. If the covered space has ceiling fans, run them in “reverse”. This will spread the rising heat over a wider area. For covered spaces another option would be hanging heaters. This is a solution that would stay in place throughout all seasons. Hanging models can be powered by natural gas or electricity. Most are created to work from a permanent wall switch. Depending on the size of the product, you can expect them to heat about a 10 foot space. Most folks think that retractable shades or awnings are for protection from the heat of the sun during summer scorchers. These products can also work to keep spaces toasty warm in chilly months. They help to block cold winds. They will also keep the warmth created by heaters staying put in your outdoor space. Warm blankets and colorful pillows will help add a cozy warmth to your outdoor space. The blankets and throws can be tossed over legs for some extra warmth; the pillows placed on benches and chairs will keep your body away from cold structures. There is also a psychological benefit to warm décor – if your space looks cozy it will feel cozy. These items can be stowed in weather proof bins. Or keep them in baskets which can be brought inside when not in use. This list of suggestions for heating outdoor spaces and keeping your patio warm this Winter offers many choices to fit a variety of lifestyles. Hopefully one of them brings inspiration to you. Don’t let your valuable space sit idle. Make the most of your outdoor design, and make many more memories.